I’m overdue to sign-off, at least on weighing-in on Tenderloin matters. I don’t live in the TL anymore. I lived in the TL for five years and worked there for six, but I’m not in the hood everyday like before. I spent most of 2017 traveling. Working with nonprofits in red state USA. Witnessing and learning about a different kind of poverty, much of it rural. I also visited great world port cities; San Francisco could be one if it ever decides to join the rest of the world. Saw a refugee camp in Italy, cleaner and more dignified than many of the streets in the Tenderloin/Mid-Market. Much cleaner in fact. The book is a must-read for anyone who wants to understand San Francisco’s extreme bipolar dynamic of pro-growth vs. anti-growth forces, a remarkably simplistic bifurcation of vulgar downtown capitalist interests vs enlightened progressives that remains prominent to this day. A good argument can be made that both groups have caused significant damage to the city and its people. Given that the progressive, anti-growth contingent have held sway for the past few decades, they arguably should get the lion’s share of credit for our failure to respond to housing demand and homelessness. 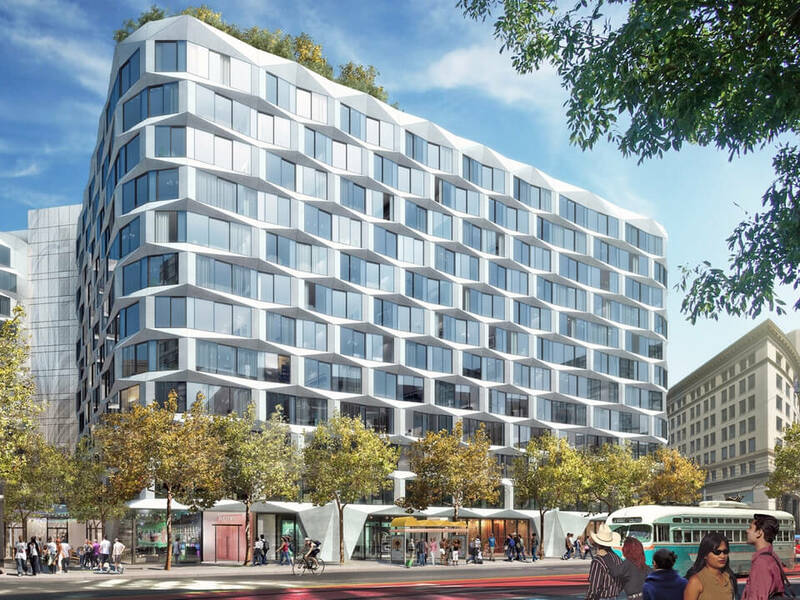 I moved out of the TL after the Magic Theatre and the 950 Market Street project successfully made it through the city’s affordable housing killing entitlement process. The city’s “local control” project approval process was a circus that allowed NIMBY, anti-children and xenophobic spokespersons to run amok. A few more essays to wrap it up. I meander, and leave you mostly with questions. And some pictures for fun. I start with square one: home. At the intersection of McAllister and Leavenworth is the coolest building in all of the Tenderloin. It’s racially and culturally diverse. It’s mixed-income. The units are small (mine was 250 square feet) but beautifully designed with huge windows so you didn’t feel like you were living in a shoebox. It was my home for five years. 83 McAllister is an adaptive reuse project designed and developed by Group i. It was a for-sale project, which made it unusual. Even more unusual was its economics: all the units were sold below market rate, which was made possible by its creative, minimalist design. It’s the project that inspired SPUR to create its “Affordable by Design” study group. It’s also the project that led me to introduce Group i’s founder/president to American Conservatory Theater. I was introduced to ACT by the mayor’s office, which at the pre-tech-boom time was all over the arts as the way to revitalize mid-Market. (Larry Harvey called it.) ACT was desperately looking for an affordable housing solution for their conservatory students (I imagine they still are), and in 83 McAllister I found a designer/developer who offered one creative solution. Joy Ou, Group i’s visionary Founder/President and Ellen Richard, ACT’s then new Executive Director, became friends and working partners. Years later they came up with $24 million dollars for the construction of permanently affordable arts space a few blocks away. Not too shabby, and roughly equal to the annual budgets of the San Francisco Arts Commission and Grants for the Arts combined. Sadly, the city – including Supervisor Kim – and the San Francisco Foundation, shrugged and squandered the $24 million dollars for permanently affordable arts space and programming for thousands of low-income children and adults. On a positive note, about a year later Joy & Ellen were joined by Loretta Greco and Jamie Mayer, and the four brilliant women created the deal to build the Magic’s new space on Turk Street. The new space will be the first new construction mid-Market arts space in decades. When I heard the Magic was being opposed by a handful of usual-suspect TL xenophobes, I volunteered to move back to help. I was lucky, my former next door neighbor, Juan, was taking a sabbatical year traveling overseas. Juan is a SFUSD elementary school teacher. I didn’t know public school teachers got sabbaticals, but that’s very cool. The rent had ballooned during my year away and was expensive (for me), but at least all of it went to an elementary school teacher. I was happy to be back. My old unit next door was bought by a nurse, Miki. The Gonzalez Family still lived on the 2nd floor. Mr. Gonzalez is a hospitality worker at the Hilton on Kearny Street. He sells handmade Mexican cowboy boots as a side hustle. Another neighbor down the hall waits tables at a restaurant downtown. The building has Asian, Latino, African-American and white residents. Young, old. People who pour coffee and change linens at hotels, and tech workers who write code. All under the same roof, sharing the same community room, roof deck, laundry room, gym, bike room, mailbox room. I initially didn’t get the idea of homeownership of apartments in the city, and I would debate this with Joy. There was just no such thing in East New York Brooklyn, as far as I knew. Joy argued that homeownership creates wealth for moderate-income households. This seemed farfetched to me, until I rented my unit from an elementary school teacher, with a nurse and hotel worker as my neighbors. The first time I remember seeing an Asian person, she was standing behind thick, bulletproof glass. She was taking my food order. We would place our money in the carousel, she would rotate it, take the money, put the food inside, and rotate it back. I remember it being on the corner of Rockaway Avenue and Fulton Street, in East New York, Brooklyn. It was a mom & pop Chinese restaurant. I remember the parents looked young, and had young children we could see playing behind the glass. The family always seemed to be there, working superhuman hours. I never saw them leave at night – it was always very late – but I imagine it was a very nervous affair in one of the country’s most violent neighborhoods. Before the Chinese family arrived there was only the neighborhood convenience store, at least that was all that was left after we burned down the local supermarket during the NYC blackout of 1977. I never got to know the Chinese owners, but I remember the mom always had a kind face that neither fatigue nor the haziness of the thick glass could suppress. It was my first neighborhood restaurant experience, and my family appreciated them being there, especially my mom who sometimes needed a break from cooking. Years later, in my newly adopted neighborhood across the country, there is farmerbrown. The moment I walked through its front door, farmerbrown was a revelation to me. It was a restaurant, but it felt like home. It sounded like home. The people looked like home. The owners were a young brown and black couple. I came to love farmerbrown; it became a refuge for me whenever I needed a dose of home. I hosted many of my important meetings with government officials, nonprofit organizations and foundation executives there so we would be surrounded by the spirit of the place, the good vibe and food. The spiritual world matters, and you could feel it at farmerbrown. You still can. I applaud the culinary and creative genius of its founder Jay Foster. I thank him for creating a refuge and place where all people – particularly people of color – can celebrate the warmth, richness and beauty of a people’s culture when so much outside at Turk & Mason evidenced despair. And I wish him and his family well in their new endeavor Isla Vida. It’s a Caribbean joint, so I imagine it will taste and sound and smell even more like home. Bring on the sofrito brother Jay. Home is where food and family are.